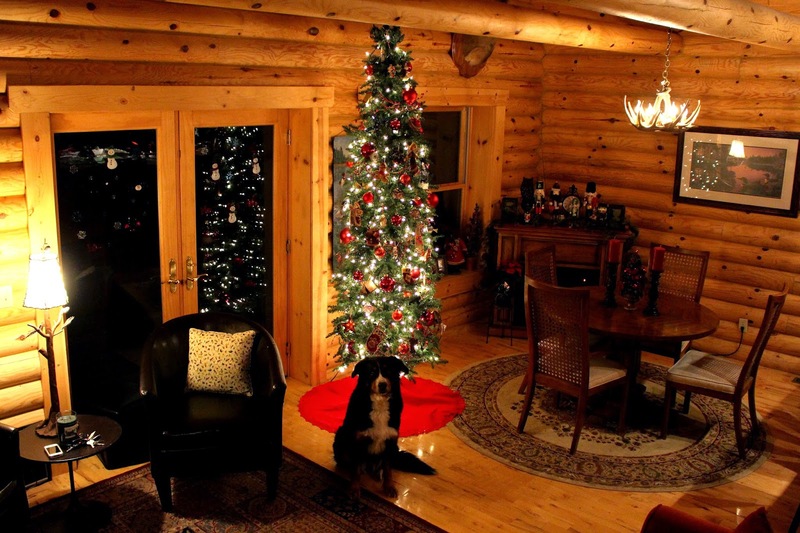 Spending time at the log cabin over the Christmas season is always extra special. We love decorating for the holiday and enjoying all the winter activities. The logs add a natural warmth and the scenery outside makes for a nice backdrop. Sitting in a comfortable chair, hot cocoa in hand and seeing the birds, trees and snow from the window is such a relaxing feeling. As the snow accumulates in northern Michigan, we will break out our snow shoes and skis. As Andy Williams once sang, "it's the most wonderful time of the year!" 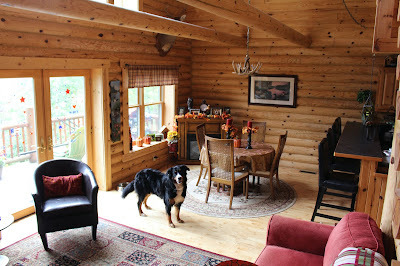 I can't think of a better place to spend Autumn than at our log home in northern Michigan. Our fall decorations are out but nature puts on the best show. This is also the time of year when migrating birds pass through so it's a great time to get out those binoculars. Bring on the hot apple cider and pumpkin pie! P.S. Are you ready to plan your own log home dream? I can help you! Please visit my website at www.bearcountryloghomes.com. We became dealers for Hiawatha Log Homes after we built one of their homes in 2008. Dogs love log cabins. They especially love the outdoor adventures that come with owning such a home and our dog Scout is no exception. 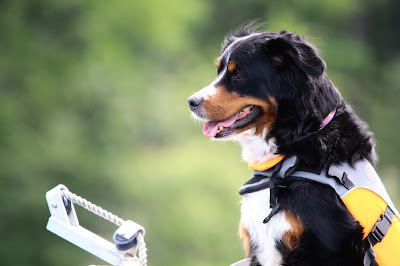 We have been taking her boating on our small lake and enjoy watching her act like she's captain of the ship. She is also the official squirrel patrol leader. Many a bird feeder has been protected by our ever faithful dog. Dogs and log cabins just go together. After 7 years in our log home, we finally finished the basement! Well I take that back, it's about 80% finished. We need to put up the ceiling and add more furniture but for the most part it's ready! In other news we have ventured back into the log home business. 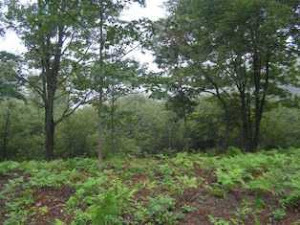 The economy is picking back up in Michigan and there are still great deals for land to build on in Northern Michigan. If you are interested in a log home, please visit our website at www.bearcountryloghomes. We would love to help you make your log home dream a reality. We've had a lot of snow in northern Michigan, particularly in Gaylord. A few weeks ago it snowed 29 inches in 3 days breaking a previous record. Snowfall, Christmas and log cabins go together. Scout thinks so too. We've had over 113 inches of total snow fall so far in the area where our log home is located. Right now I feel like I am working for the propane man and the snow plow man! Though I do have to admit it is pretty and I've enjoyed the powder for snowshoeing and skiing. How is winter in your area? It's snowing in Northern Michigan! 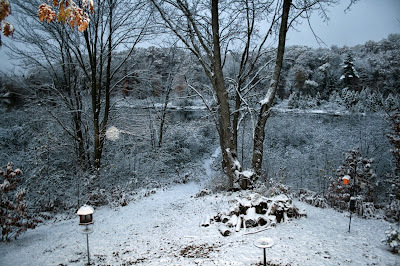 This morning I woke up to this powdered sugar winter wonderland! The high temperature today is 37 degrees. Autumn is definitely over! Has anyone else had an early snowfall? Welcome to the Log Cabin Dream! My husband and I had the dream of building a cozy log cabin in the woods of Northern Michigan many years ago. Our dream finally came true! . Join my log cabin crowd! Just A Little Something For You! 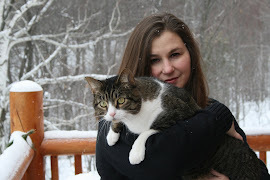 All photos and written content on this blog are copyrighted & cannot be used without my written permission.